I solve your dogs nuisance behavior problems quickly. - I instruct owners in how to manage their dogs behavior and train their dog to heel, sit, down, and come on command when distractions occur and without food bribery. - I train your dog at your home, in your neighborhood, or anywhere life includes you and your dog, and when your life is too busy for dog classes. "My husband and I have worked with Marlene and our Norfolk terrier, Harriet, for almost four years. We have learned to adjust our behavior while handling Harriet positively guiding her through difficult issues such as aggressive behavior towards other dogs and inappropriate demand of attention when people visit our ohome. Harriet also demonstrated aggressive behavior inside our home claiming for herself certain areas in our family room. Marlene designed a program for my husband and me to help us become acclimated to Harriets new program. She would come to our house (sometimes with other dogs that were in training with Marlene) and work Harriet, the other dogs and us in specific situations that were problem areas. Moreover, Marlene was always available by phone if problems arose during the day. Her work included various exercises and proper use of the leash which was often difficult for us when schooling a very small dog. More important, all work was accomplished without treats and other training devises. We often worked outside our home where strangers walked in close proximity to Harriet and other dogs were present. Im keeping my husbands legacy alive. I began working with John M. Henkel as a client in October 1997 and by December I was accompanying him on client appointments because of my talent and intense desire to learn. 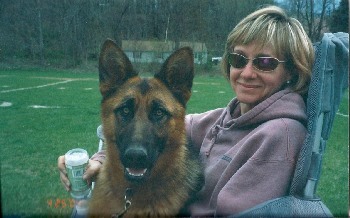 I apprenticed with John, studying canine psychology as a behavioral science using behavior modification techniques and obedience training to instill desirable behaviors and qualities in any dog, regardless of its breed or breeding. Later as his partner, we solved the deep seeded problems no one else could solve. Frequently a dogs behavior was modified right in front of our students. When John passed away, it was the saddest day for all who knew this brilliant Master Trainer, sadder for all the dogs that needed him. Im so grateful John recognized and developed my talent. Im here now to carry on his work and his legacy. 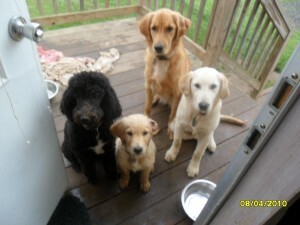 "Where is our Goldendoodle Friend?" We are currently accepting reservations and deposits for your Valentines Day puppy! Please submit the Contact Us form at the left or call the number above to insure a puppy from one of these two litters.